Congratulations to Freda from Freda's Voice, the randomly chosen winner of my international bookmarks giveaway! Freda, I will mail these bookmarks to you very soon. Thanks to everyone who entered the giveaway. If you didn't win this time, don't despair! Other giveaways are posted on the right side of my blog, and I will be hosting more of them in the near future, so please stay tuned. I was in a "cookbook mood" when I reached for this book from the shelf and discovered a tempting new recipe. 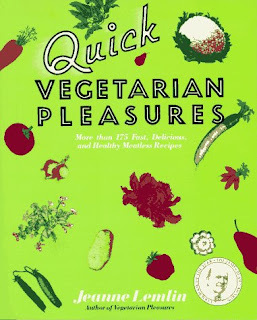 Published in 1992, Quick Vegetarian Pleasures by Jeanne Lemlin, a gift from my sister to my vegetarian daughter, features recipes for meatless meals ready in a jiffy. Over the years, when the craving for homemade pizza struck, I tried all sorts of pizza crusts--made from scratch, from ready-made dough from the supermarket or "pizza man", from Boboli bread, and from English muffins--but I don't remember using pita bread as a crust. In the book, the author calls this "the most popular lunch" in her house, "served at least three times a week". Now I know why! I've already made them several times this past week, for lunch and dinner, and have topped the sauce and cheese with healthy veggies such as thinly sliced tomatoes, zucchini, mushrooms, black olives, and spinach, and I want to try broccoli (don't tell George Bush). These pizzas are very easy to prepare, and are really so simple that all you need is the idea, rather than the recipe, but the results are surprisingly gourmet. What makes this pizza even more sensational is that you use a combination of mozzarella and Muenster cheese, because the latter adds creaminess. I used larger pita bread and cut them in half after they were baked, but you could use smaller ones. You could get experimental and try whole wheat pita bread, or a red Thai curry sauce instead of tomato sauce for a more exotic pizza. Or you could even add shrimp or grilled chicken and change this into a non-vegetarian meal. The options are limitless. Pita pizzas are ready to bake for 8 to 10 minutes in a 400º oven. Really Random Tuesday is a way to post odds and ends--announcements, musings, quotes, photos--any blogging and book-related things you can think of. If you're inspired by this idea, feel free to copy the button and use it on your own blog. Leave a link in the comments if you’re participating and I'll add it to this post. Please be sure to visit Naida's blog, the bookworm, for her terrific Really Random Tuesday post. Those pizzas look delicious. I think my sister might like that cookbook - thanks for the Christmas gift idea. Oh My, those pizzas look great. We had pizza for lunch today, however, it was Pan Pizza from Pizza Hut. Nevertheless, it was very tasty too. I am going to have to try this recipe some day. Sounds so easy and good. 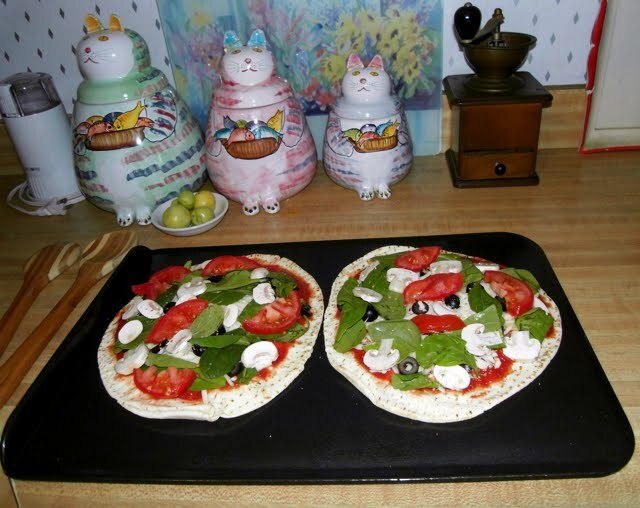 Pizza looks yummy and easy:) and, I have to tell you how much I love the Cat canisters; so sweet. Kathy, it does make a nice gift! Gigi Ann, I really enjoy making these pita pizzas. The crust is crispy and delicious. Diane, thanks for stopping by! Sorry I haven't been participating in Really Random Tuesdays for a few weeks now. I intend to do so again! Oh, those pizzas look soooo good! Wow the pita pizzas look sooo yummy! Adn those cat canisters are really cute! Those pizzas look yummy. Sorry I didn't take part this week, I had to get a piece of writing finished and sent off ASAP.Just finished it and posted it today. Love the pita pizzas, and it's something I had never thought of before! I think I am going to make one for lunch, as I have all the ingredients and a few fresh veggies right here in the fridge! Thanks so much for sharing this with us! I LOVE the look of your Pita bread Pizzas! What a great idea! Avis, please don't view doing this meme as an obligation. On a different note, I have a vegan sister, and I think she misses pizza. Vivienne, I don't do this meme every week, and I am the host! Your writing is the priority. Zibilee, that's great! They are so delicious! And congrats to the wonner... and the pizzas a re delicious... mouth-watering...I wish I could try it out too. It's about time the Beatles made it to iTunes. I ripped the CDs years ago and put them on my iPod. I had forgotten that they weren't available yet. Those pizzas are making me hungry. I love pizza with a bit of a twist, different breads as a base and different fillings as a topping. At the moment my favourite is apple and red berries 'pizza'. Veens, thanks for stopping by! Petty, have you ever had apples and cinnamon "pizza"? It is more of a dessert than a meal. Red curry pizza--what a cool idea (okay, hot)! Your pizzas are gorgeous. Will definitely have to attempt this. Thank you! Yummy looking pizza. I've never used pita bread either. This sounds like a cool book since I'm mostly vegetarian. 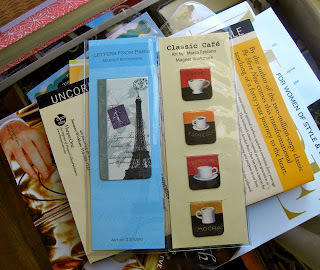 Hello, where did you get the bookmarks from-I am a huge fan of collecting bookmarks and anything French. I love your kitty jars. PS I made pizza yesterday and turned the leftover dough into an apple turnover. Suko those pizza's look so good! Very creative too, I never thought to use Pita bread! I'll have to try it . Your kitty canisters are adorable! Thanks for stopping by my site too. I'm a little behind in visiting my fav. blogs! But today is catch up day. Hope you have a nice weekend. Its snowing snowing here, we have about 4 in. now yuk! Oh, George, my favorite Beatle, that is not a flattering pic! ds, it's such a simple idea, but you can get very creative! Alison, as a vegetarian you can try all different kinds of veggie toppings and make these pizzas healthy. Esme, the bookmarks are from Barnes & Noble, but I've seen them at other stores as well, even drug stores. Natalie, thank you and have a wonderful Thanksgiving. Lisa, LOL! Thanks for stopping by. Amanda, actually it's regular spinach (uncooked) but baby spinach would be good, too.